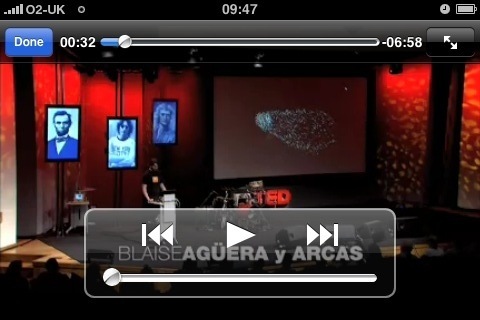 Over the weekend I discovered the TED application for my iPhone. For those not familiar with TED, it’s a conference in the states that focuses on Technology, Entertainment and Design. Speakers are invited to talk for 18 minutes on subjects important to them. There are a huge range of speakers and subjects, from Bill Gates to JJ Abrams. There really is some fascinating stuff there, its that’s well worth a look. So anyway, I found this iPhone application and spent a few hours on Sunday watching some of the talks. It struck me what a great idea the application was. It’s roughly the same content as the TED website, but it just brings the whole thing together in a single app – another good example of software and services. I couldn’t of course, there’s no app for me to use. But there should be, not just for TED but YouTube, maybe the BBC iPlayer. Perhaps a host of other tools that people are used to on the iPhone. MS are missing a trick here I reckon. At the moment there’s a huge amount of Software + Services (an MS terminology) innovation happening on the iPhone. It’s really good stuff, but the device is somewhat limited by the fact it’s a phone. MS should be making the XBox into the home equivalent. The XNA Creators Club already goes some way to allow home-brew games, written by the community and published on XBox live. So the basic infrastructure is there. They have a well developed development environment (though how suitable it is for non-game applications I don’t know) and a delivery and billing mechanism though XBox Live. App Stores seem to be the next big thing in the mobile world, but I reckon they could be equally important elsewhere. I’m using XBox as an example here as I have one, but the same would also apply to the PS3 or Wii – indeed I believe you can already use the iPlayer and YouTube on both.